Part 3 of a series looking into what the most expensive stadium deal in history could mean for the city. Leo Nordine woke up to another Tuesday and pursued his regular morning routine: brewing a cup of coffee, picking up the newspaper and taking a moment at the breakfast table to assess the property listings of the day. But on Tuesday, Jan. 12, it was not the business section that grabbed his attention. "The day the announcement came out, at 7 in the morning I opened the Los Angeles Times and I see 'The Rams Are Coming' and I'm like, 'Wow.' Then I go to the office and literally at 7:30 my phone was ringing off the hook for all my Inglewood properties," Nordine said. Nordine, with 30 years of experience in Southern California real estate, knew the market in Inglewood would never be the same once the Rams made their move official. 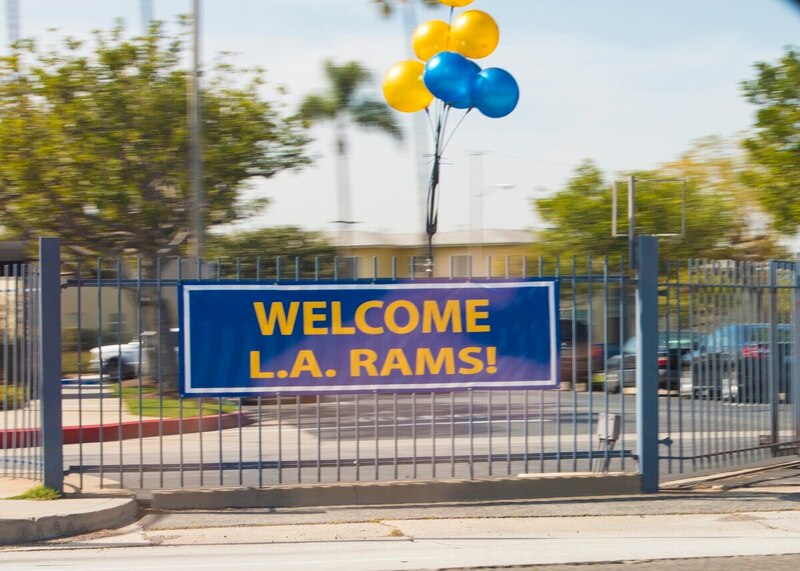 Since the announcement of their return, he has already seen a dramatic increase of interest in the properties near the construction site of the Rams' new Inglewood stadium. "We're seeing everything go up pretty strong right now, pretty dramatically actually across the board from Watts to the beach, but yeah Inglewood is gonna do well, really well, for the coming years," Nordine said. The increased interest in properties has affected many of Nordine's own, in addition to those of other Inglewood real estate agents. One such location, which Nordine acquired about a week before the news went public, was a listing on Arbor Vitae Street in Inglewood that another broker had been trying to sell for months. Nordine sold it in a flash after a bidding war sent the sales tag $40,000 above original asking price. "There are people trying to buy every one of those right now, so it's going to look a lot better. It's gonna be full, with all new businesses. They'll sell T-shirts, you know, there'll be restaurants, the sports bars. It'll really boost the economy," Nordine said, "I don't see any negative to building around there and redeveloping it." And he says it is not just commercial properties that are piquing buyers' interest. Residential sales, too, are already increasing and sending property values upward. "I had a friend who had a little one-bedroom condo in a dead part of Inglewood," Nordine said, "Fifty years old, nobody ever buys there, and then he got multiple offers on it. People are buying everything, it's funny how it works." One thing Inglewood residents can be sure of: Rents will be on the rise. "Rents are gonna go up, rents always go up. There's no rent control on any commercial property so, if the economy improves landlords will boost the rent," Nordine said. As he sees it, that's just the business of real estate. And while rising rent prices will certainly have locals concerned about affordability of property in the area, Nordine explained that it doesn't have to mean trouble for the community. It all depends on how the city plays it out, and how city leaders choose to make use of the forthcoming economic boost. "There will be a ton of people coming in there and a ton of money, so I just hope they handle it well," Nordine said. Nordine's vision for Inglewood would be to make sure the money brought in goes right back into community efforts to revitalize the education system, among other things. "I think it would dramatically affect Inglewood if they can just get as much taxes out of the Rams as they can, improve the schools, and if the schools get better people will move there," Nordine said, "If people want to move there, property values will keep going up and everything will get better from there." Nordine's experience is not an anomaly. The new stadium in Inglewood has generated a lot of buzz in the real estate world. Talk of rising property values, redevelopment, and economic growth have surrounded the entire city since the announcement of the project. Henry M. Koffman, a real estate development expert, also said he thinks the new stadium is going to do great things for Inglewood and help improve the parts of the city that could use a facelift. "I think everyone is going to benefit, the community will benefit," said Koffman, who also is an engineering professor and has been involved in the real estate industry for 30 years. Some redevelopment plans along Market Street are already underway, Koffman pointed out, and more proposals are sure to follow as the project continues to gain momentum and attract outside developers. "Typically how stadiums work is people buy up land around the stadium where the real money is," Koffman said. "A lot of speculators will be going in there to buy property and flip it." With Stan Kroenke at the helm, Koffman says there is little reason to worry about problems associated with the stadium's development. "With the Los Angeles Rams, the owner knows development. Some people think he is spending a lot of money, but he will make that back," he said. Koffman believes the new stadium in Inglewood will bring positive changes to the area that will parallel the resurgence Downtown Los Angeles experienced after the Staples Center was built. L.A. Live has become a major attraction in the downtown area, which has seen a lot of growth in the hotel and restaurant industry, and Koffman predicts Inglewood will see similar effects. "My motto is that downtown, L.A. Live revitalized the area," he said. But not everyone in the city thinks the stadium will be as great as it seems. Some business owners, like Jack Levan, owner of Vajra Books and Gifts, fear that the stadium will force local businesses out of the area. Koffman disagrees. "There will be some turnover, but some businesses will probably stay there and make their own improvements," Koffman said. "The stadium will help the unemployment rate in the area as businesses hire more local people to work." Although Koffman does believe the development will bring some challenges – including higher rents – as property values increase, he stands firm in his beliefs. The way Koffman sees it, building stadiums in certain areas, like Inglewood, does work and will benefit the neighborhood greatly. Across from the stadium site at 3750 Century Boulevard, a sign stands advertising a business space available for lease. This location offers direct access to the stadium and will likely see high foot traffic on game days. Andrew Dilfer works for Jones Lang LaSalle, the company that owns the space and said the building is explicitly for companies that help serve LAX, specifically freight boarding and trucking. "LAX itself will dictate enough companies that need to be around it," Dilfer said. "I mean it's great for Inglewood to have the Hollywood Park go there, but I think you still need large square footage of industrial buildings around the airport to support the functions of the freight boarding industry." While Dilfer thinks the NFL stadium will be beneficial to Inglewood, he explained that Inglewood is already a popular destination for business due to its availability of real estate and its convenient location. "You've got a big industrial pocket of companies that have come from Culver City and Marina Del Rey into Inglewood because there's no space up there, so it's been a catcher's mitt for that as well as companies who want to be by the airport," Dilfer said. JLL's building on Century Boulevard has four tenants. Although the company still has the sign up to advertise an open space, Dilfer confirmed that the spot has already been filled. Looking forward, Dilfer agrees that real estate straight across from the stadium is a coveted spot, but emphasized that businesses surrounding the stadium cannot suddenly cater only to NFL fans. "If the stadium went to one of the sites, not the Carson one, but the one way out in the City of Industry there's absolutely nothing around there so the infrastructure around there would be set up for that, but here you've got a city that was doing just fine before this," Dilfer said. "You've got the infrastructure already here." Although Christal Ryles attended college on the East Coast and once resided in both the Valley and Long Beach, the 29-year-old calls Inglewood her home. She was born and raised in the city and has now returned to live in the house she grew up in. The Ryles family owns both their home, which is located in the neighborhood across from the soon-to-be NFL stadium, and an apartment building close to the Metro line. Ryles thinks some landlords may increase rent if there is an opportunity to do so, but is not positive her family would follow suit with their own rental property. Ryles said she'd rather have renters who pay on time than raise rent simply because they have the opportunity to do so. Consistent tenants who the family does not have to worry about evicting are the main concern of the family. "We respect the community," Ryles said. "We have a genuine concern and love for the people in Inglewood. It's more about being fair and doing the right thing." As a longtime Inglewood resident, Ryles said the people who are from the city and live in the city absolutely love it. Outsiders, on the other hand, sometimes may not see the beauty of Inglewood. Ben Tomjack moved from Nebraska to Los Angeles last October. The 25-year-old stayed at a friend's home in Culver City while looking for an apartment for himself and two other friends. After seeing multiple advertisements on Craigslist for a house in Inglewood, Tomjack decided to check out the property. When he arrived, he knew immediately the property was not what he was looking for, particularly because of its condition. "The house itself was not the reason why I didn't want to live there specifically, but the neighborhood it was in. I pictured myself walking around after dark by myself, and I didn't feel good about that," Tomjack said. After his experience in Inglewood, Tomjack decided he would find a place to rent in a different city. The foresight of real estate experts mixed with the opinions of residents, business owners and politicians makes predicting the future of Inglewood difficult and leaves many questions surrounding community sustainability unanswerable. At least for now. Comparisons to other similar venues that have been established in comparable communities suggests not a rapid improvement, but one gradually happening over time. But if there's one thing that's for sure, it's that Inglewood has less than three years to prepare for what many are hoping might be the most revolutionary change in its history.